Kakhovka Hydroelectric Station [Каховська ГЕС; Kakhovska HES]. 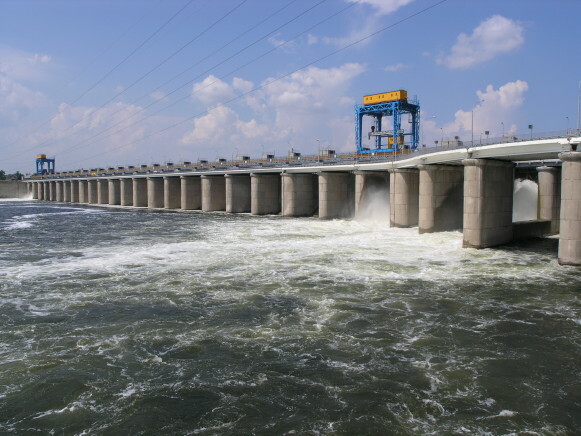 The second-largest and southern most of the Dnipro Cascade of Hydroelectric Stations. It was built on the Dnipro River in the years 1950–6, 12 km southwest of the city of Kakhovka, in Kherson oblast. Each of its six generators provides 58,500 kW; together they produce an annual average of 1.4 billion kWh of energy. A highway and railway traverse the station’s 3.84-km dam complex, which holds back the waters of the Kakhovka Reservoir. The city of Nova Kakhovka has arisen next to the station.